Terry Gaspard Archives - Joelle Delbourgo Associates, Inc. Restore your faith in love and build healthy, successful relationships with this essential guide for every woman haunted by her parents’ divorce. Over 40 percent of Americans ages eighteen to forty are children of divorce. Yet women with divorced parents are more than twice as likely than men to get divorced themselves and struggle in romantic relationships. In this powerful, uplifting guide, mother-daughter team Terry and Tracy draws on thirty years of clinical practice and interviews with over 320 daughters of divorce to help you recognize and overcome the unique emotional issues that parental separation creates so you can build the happy, long-lasting relationships you deserve. Today, about 40 percent of all children in America will experience a parental divorce prior to the age of eighteen. For years, researchers have identified the damage divorce inflicts on the lives of children. In recent decades, many studies have examined the negative impact of parental divorce on children into adulthood. However, few have offered concrete strategies for overcoming these difficulties and none have shed light on the unique challenges of women as daughters of divorce. As a therapist practicing for over thirty years, Terry Gaspard has noticed that while parental divorce impacts most children into adulthood, daughters experience unique vulnerabilities that put them at great risk of passing on the legacy of divorce to their children. Terry’s interest in the lives of women who grew up in divorced families began with her own experience. 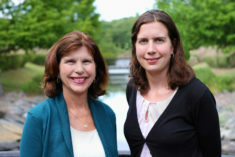 She decided to write Daughters of Divorce with her daughter Tracy Clifford because the topic of overcoming the legacy of divorce is a personal one for them – divorce goes back five generations in their family. Having experienced divorce in their own lives, they have a keen understanding of how it can affect the inner lives of children, and impact the kinds of adults they become. In their new book, Daughters of Divorce: Overcome The Legacy of Your Parents’ Breakup and Enjoy a Happy, Long-Lasting Relationship, mother-daughter team Terry and Tracy tackle a timely and very important topic – the intergenerational aspect of divorce. They draw on Terry’s thirty years of clinical practice and interviews with over 320 daughters of divorce to help readers recognize and overcome the unique emotional issues that parental separation creates so they can build the happy, long-lasting relationships they deserve. 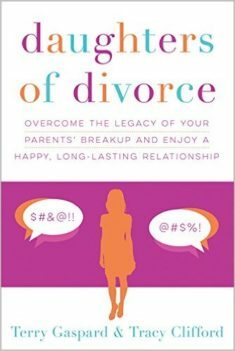 Unlike most books about divorce, Daughters of Divorce asks women to honestly examine their own lives and identify how their past might contribute to relationship failure. In Daughters of Divorce, the authors unveil The Seven Steps to a Successful Relationship which provides a road map for women to recognize destructive dynamics in intimate relationships and take steps to change them so they can create strong partnerships and break the legacy of divorce once and for all. Terry Gaspard, MSW, LICSW, is a licensed therapist with over thirty years of clinical experience specializing in divorce, children, and families, as well as a nonfiction writer and college instructor. She is a sought-after speaker who frequently offers commentary on divorce and her research on daughters of divorce. 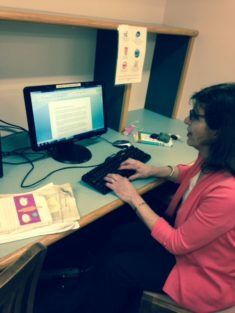 Two of Terry’s research studies on adult children of divorce have been published in the Journal of Divorce and Remarriage. Terry is a regular contributor to Huffington Post Divorce, divorcedmoms.com, divorcemagazine.com, and yourtango.com. Tracy Clifford is a writer and conducted the in-depth study of daughters of divorce with her mother. Terry and Tracy live in New England and are co-owners of movingpastdivorce.com.